Congratulations! 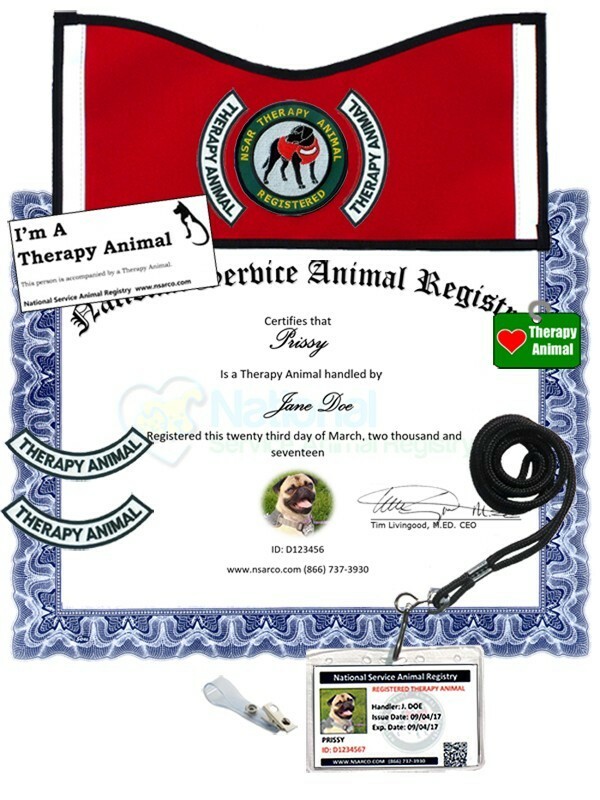 You'll be glad you registered your therapy animal with National Service Animal Registry! The NSAR Deluxe Therapy Animal Kit comes with nearly all the options of you'll need to comfortably and officially visit schools, hospitals, nursing homes, and disaster areas. Click on the Kit Contents tab below to view all the items that are included in the Deluxe therapy animal Kit. If you are gratified helping others and bringing comfort to those in need, then our therapy animal kit is worth the effort and expense. You'll be repaid in smiles! This kit has all the essentials you'll need to get approval to visit nursing homes, schools, hospitals, and disaster areas with your therapy animal. We offer a "No-Risk" money Back guarantee, so order with confidence! NSAR made us jump through a few hoops, but then they are a legitimate organization. Once we got certified as a therapy animal team, my dog and I have been able to visit several nursing homes, bringing comfort to a lot of lonely aging people. It warms my heart to do that!